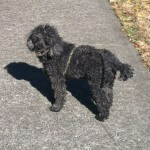 A lot of people have asked how the Dark Poodle of the Apocalypse is doing. Since I do a great deal of chatting on Twitter, it’s often hard to get into details at 140 characters at a time. A lot of my updates have been necessarily brief as a result. So I thought I would add a more detailed update for those of you who are interested. And also, I can’t say enough about how thoughtful and supportive everyone has been. Thank you. The good news, of course, is she is now doing well. But it’s been a rough couple of months. Jasmine, as she is more colloquially known, has been struggling for quite a while. As she’s gotten older, the cute little doodle developed a bit of a cough, though not severe or frequent. But starting last winter, it began to increase in both frequency and severity. It finally reached a point where she was coughing and gagging several times a day, and she just sounded awful when it happened. So early in the summer we had a vet visit. We learned she had an enlarged heart and was overweight. For her age and breed, the heart condition is not unusual, but the weight had to come off. We did not think we were over-feeding her, but we learned something important. If you want a (reasonably) accurate calorie count, you gotta weigh the food, not rely on the volume measure serving size numbers. We’d been feeding her as recommended by volume, but when I weighed her food instead, I learned she getting about a third more calories than she should. “Serving size: half-cup for 54 grams” the package said, but a half cup turned out to be about 70 grams. 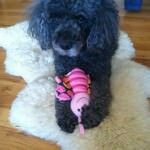 A poodle and her pink bumblebee. She was also put on medication. 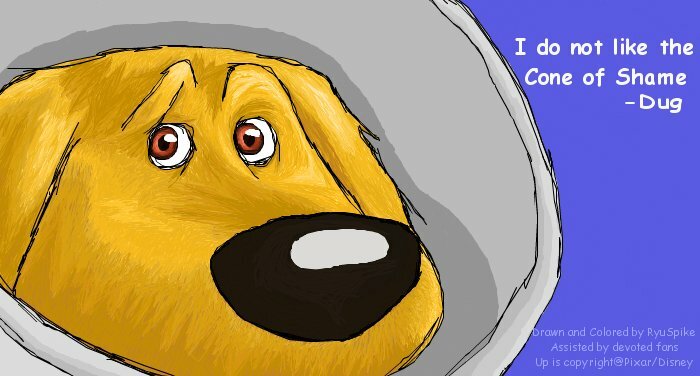 We learned it’s a lot easier to give a dog a pill than to give a cat a pill. One Monday evening, she vomited up her supper, and over the next day or so seemed to lose all energy. She wouldn’t eat, didn’t want to go for walks. Troubling, to say the least. The only positive was no coughing, but that was cold comfort. 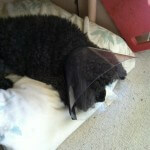 By Wednesday, we knew it wasn’t a passing illness, so we went to the vet. An x-ray was inconclusive, but suggested possible pancreatitis, so Thursday we were back for an ultrasound. Her pancreas was fine, but a blockage was found in her small intestine. Unless it moved by the next morning, they were going to have to do surgery. Given no change Friday morning, we returned for surgery. It was a long, worrying day. With her heart condition, the surgery was higher risk than normal, but doing nothing would probably be fatal. The problem turned out to be bird seed. Our hungry wuppy had decided the fallen nyjer thistle under the feeders was DEEE-licious, and had eaten enough to clog her pipes. 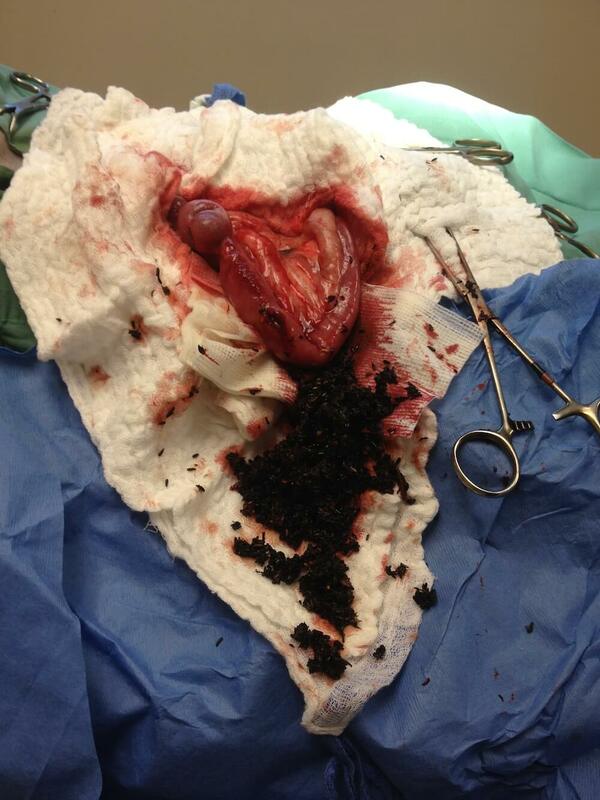 The surgeon was surprised enough that he took a picture of just one mass of seed he cleaned out during surgery. I’ve posted the picture here, but I should say it’s of surgery in progress. If you’re squeamish, you might want to skip the photo. 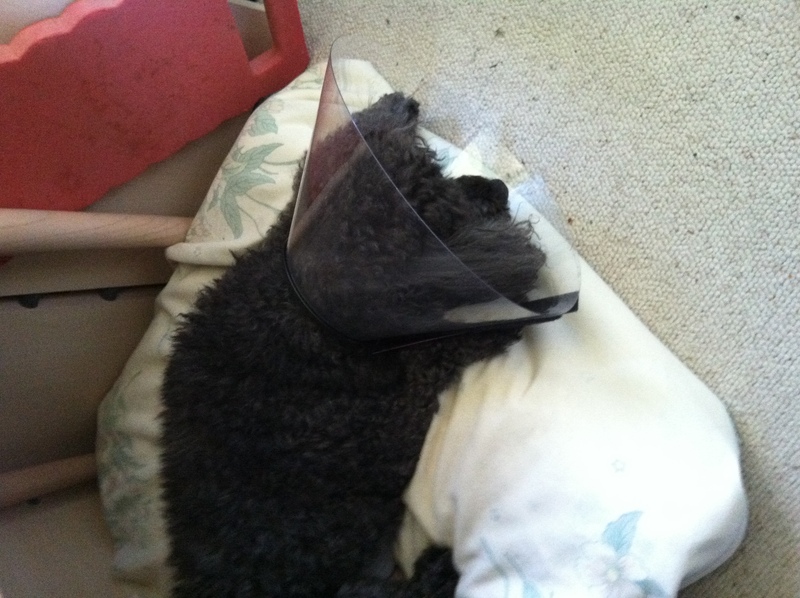 Sad poodle wears the Cone of Shame. The surgery was a success, and over the course of two weeks, she recovered slowly but surely. We had some sad Cone of Shame moments, and some “Why can’t I jump up onto the couch by myself?” moments, but all in all she did well. Until her coughing came back. And this time, when it came back, it was much worse. It’s fair to say we were moving from relieved about the surgery to freaking out about the coughing at lightning speed. It was time to escalate. 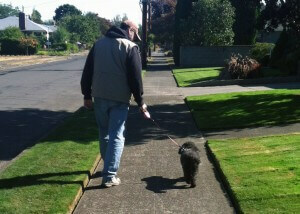 A week ago Friday, we made an appointment with a doggie cardiologist for the next day. Even that little wait was too much. At about 2am Saturday morning, Jasmine had her worst coughing fit yet, so severe and so long that we took her to the 24-hour emergency vet clinic. As it happened, the cardiologist worked out of the same clinic, so while she wouldn’t be in until morning, at least we were being seen at the same place. The coughing settled down a bit, and while we were there Jasmine was treated with albuterol and given a cough suppressant. That helped, we went back home for a short sleep, then returned for our appointment at 11am. The cardiologist was great. She was thorough and engaged, spent lots of time with us. Jasmine had a full work over, including an echocardiogram. And we got some good news. C’mon, people. We’re walking here. What’s the hold up? Yes, Jasmine does have a heart condition—degenerative mitral valve disease—but it’s not advanced and does not seem to be the cause of her coughing problems. We have to keep an eye on it, but it’s manageable. The immediate problem seems to be bronchitis, possibly due to allergy. The inhaler treatment helped a lot, which was a clue. We went home with prednisone and antibiotics, and are pleased to report the coughing is all but gone. Jasmine isn’t as quick as she once was, and she gets tired more quickly. But she’s going on walks, sniffing stuff, wiggling and wagging her tail. When the current prescriptions are done, we will return to the cardiologist for a follow-up. Jasmine will use an inhaler in the future, and will have regular follow-up visits to keep an eye on her heart. But the worse of the recent weeks appears to be over. 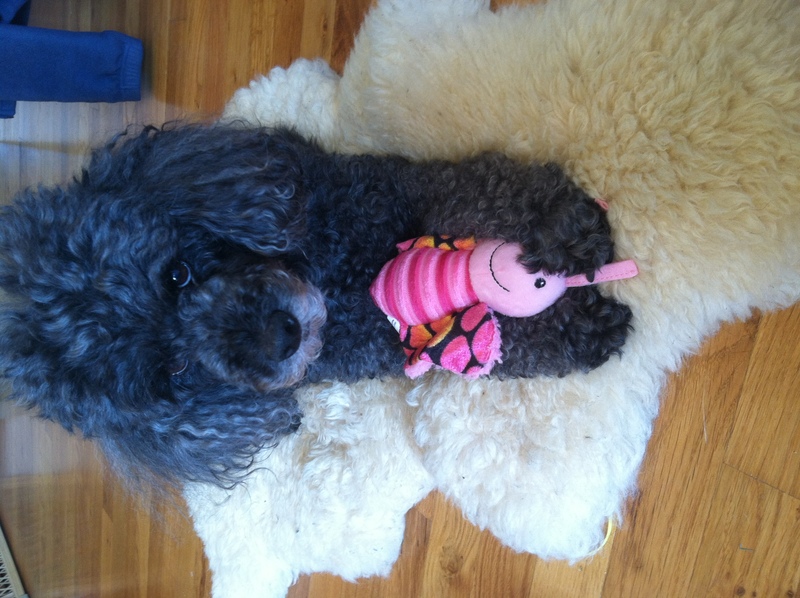 The little sweetie is back to being the most Dangerously Cute Poodle in the Universe. Me and the Dark Poodle of the Apocalypse. D’aw, glad to hear she’s doing so much better! I’m sure she’d love a minion!